The Austrian pine (Pinus nigra) could be the perfect conifer for your city landscape. It grows best in USDA Zones 4 through 7 and is able to withstand many of the challenging environmental conditions—like pollution and salinity in the air—of the urban environment. The species name for this pine tree is Pinus nigra. It is considered to be in the Pinaceae family. Pinus is the Latin name for pine; nigra derives from the Latin word niger, meaning black or dark. 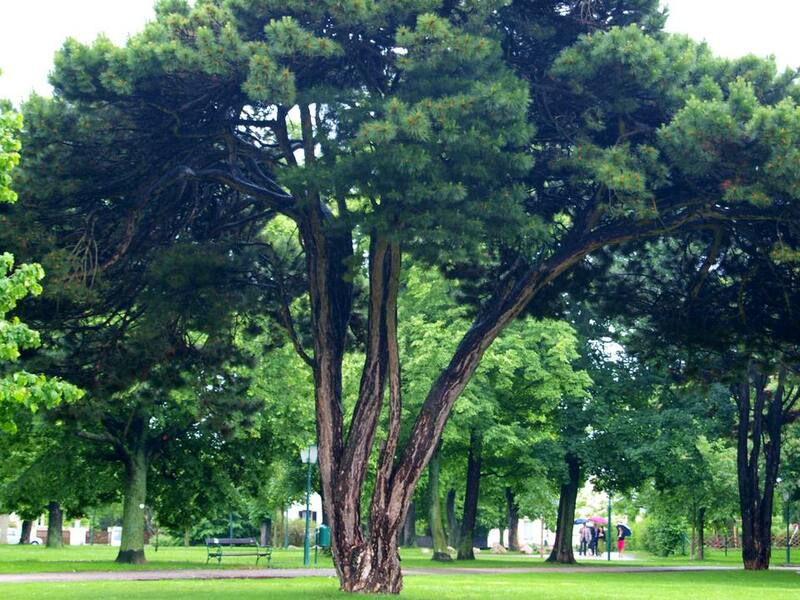 The standard common names for Pinus nigra are Austrian pine and European black pine. However, it also may be called Australian pine, Crimean pine, Corsican pine, or Pyrenees pine. Ideally, grow this tree in a location that receives full sun and can also tolerate partial sun. The Austrian pine is able to grow in many different types of soil, especially ones that can be considered difficult, like clay or sand. However, it thrives best in deep, moist soil that drains well. Water new trees regularly for the first year and during dry periods for the first three years. Once established, Austrian pines are fairly drought-tolerant. There are two needles in each fascicle. They are 2 to 6 inches long and dark green in color. The tree is monoecious and the male and female flowers are both yellow to yellow-green. The female flowers may also come in purple. The brown cones are shaped like an egg and measure 2 to 3 inches long. Pinus nigra is popular as a specimen tree and for windbreaks. The tree forms a pyramidal or oval shape while young and, as the tree ages, its crown becomes rounded and forms a flat or dome-shaped top. It typically grows to 40 to 60 feet tall and 20 to 40 feet wide. In rare cases, Austrian pines can grow over 100 feet tall. As with most trees, you can remove any dead diseased or damaged branches as needed. Otherwise, there should be little pruning involved in the upkeep of your tree unless you need to remove branches over a street or walkway. Want Your Own Pine Nuts? Grow an Italian Stone Pine!